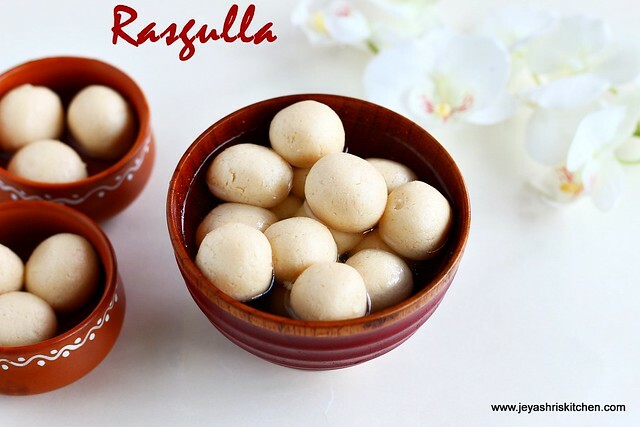 Rasgulla | a popular bengali recipe , i wanted to post here for a long time. Though i have tried this few times, never had a chance to post this here. 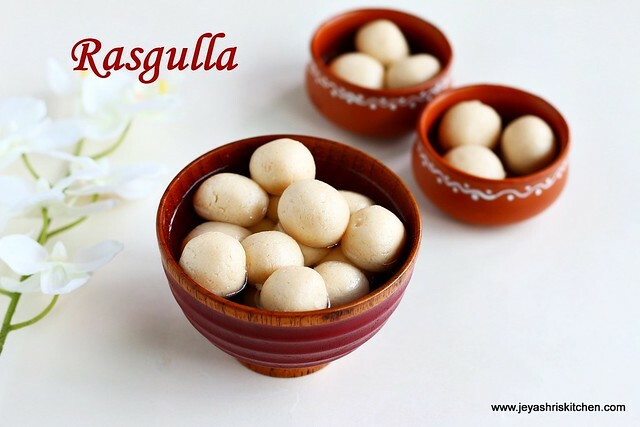 I have many requests from readers to post the rasgulla recipe , so finally today i am posting the popular spongy bengali rasgulla. I learnt this recipe from my cousin, who makes rasgulla extremely well. She was here with us this week and she instructed me in making this sweet. We all enjoyed the rasgullas a lot. Try this recipe and let me know how they turned out. Boil the milk in a heavy bottomed vessel and once it comes to rolling boil simmer the flame and add the yogurt to this and mix well. The milk will start curdling. Then switch off the flame. Immediately add the ice cubes. Sieve this in a clean cloth and drain the water. Wash this You can use this water for making chapathi. Squeeze the water and hang the chenna for 2 hours. Let the water completely drain. After 2 hours take out the chenna from the cloth and transfer to a wide bowl. Add the rava(if adding) and knead the dough for 20 minutes. This will make it soft. If it is not kneaded wel you won't get soft rasgullas. So be patient and knead it well. Listen to you favourite music and knead the dough. Make them into medium sized balls. In a pressure cooker add the sugar and water and let it come to a boil. No need to check the String consistency. Add the rolled balls to the sugar syrup and cover the pressure cooker. Keep the flame high and let be for 5 minutes. Even the whistle comes it is ok.
Let this be in very very low flame for 5 minutes. Switch off the flame. Let the pressure subside on it own. Open the cooker and the rasgullas are done. This will increase in size mostly double. So just chose a cooker accordingly. 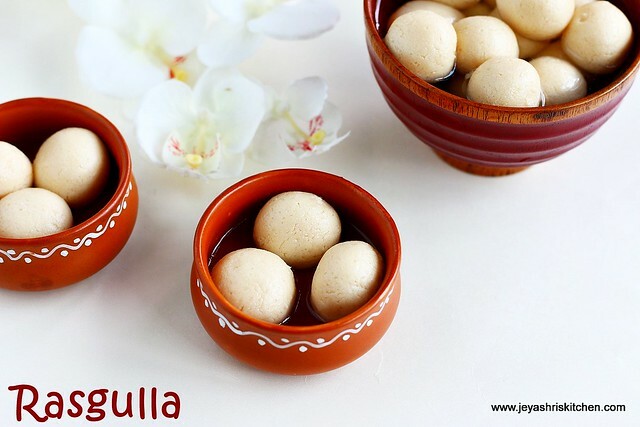 Soft sopongy rasgullas are ready to serve. Do no keep it in the refrigerator. Else it will become harder. Lemon juice can also be used instead of curd. In that case use 2 tblsp of lemon and dilute this with 3 tblsp of water. Once the milk is getting curdled immediately swich off the flame and add the ice cubes. Adding ice cubes will reduce the heat and stop the milk from curdling further. Kneading is more important as it will give soft and spongy rasgullas. Do not add sugar while kneading the chenna. It will get caramalised and in turn change the colour of the rasgullas. I added 3/4 cup of sugar and i felt it is perfect. If you want little extra sweet, you can add 1 cup of sugar. Some people add a pinch of baking soda to the chenna while kneading. But i felt without adding that my rasgullas turned out soft. Haha yes raji. Almost after 5 years. looks so tempting and spongy..
Looks yummy..how much time it will take for the milk to start curdling? Nice one . Which milk did you use . Bec I tried with dutch fresh but it did nt curdle howmuch ever curd I added . Soagain I tried with lemon but the amount of panner I got was very less. Hi i used amul full cream milk. It will take few minutes for the milk to get curdle. So wait and keep the saucepan in a low flame. Very nice. For how many days will it be gud? came out very well.... enjoyed.... thanks for perfect measurements!!!! Thanks for the reply jeyashri. I have tried many of your recipe's, it came out very well. Continue your blog it's very helpful those who started cooking newly.